Cerebral plasticity and neurological recovery can be stimulated in the ischemic brain by exogenous pharmacological and cell-based treatments. Neurons, neuroblasts and endothelial cells synergistically interact with each other as a regenerative triad, creating an environment in which neurological recovery takes place. Developmental genetic programs are reactivated. Brain neurons and capillary cells are enabled to sprout, and glial cells support plasticity processes. Until now, the large majority of studies were performed in young, otherwise healthy animals, which lack the risk factors and co-morbidities associated with human stroke. Recent behavioral, histochemical and molecular biological studies have shown that restorative brain responses may differ between young and old animals, and that they are also modulated by vascular risk factors, such as hyperlipidemia and diabetes, which are highly prevalent in ischemic stroke. We claim that age aspects, vascular risk factors and co-morbidities should more intensively be examined in future experimental studies. Confounding effects of age, risk factors and co-morbidities should carefully be considered in clinical proof-of-concept trials. Recently, it has been demonstrated how apocrine glands, as well as several cutaneous apocrine tumors, do not express calretinin. In the current report, we studied calretinin immunoexpression in 33 cases of cutaneous metastases of ductal breast carcinoma, as well as in seven primary cutaneous apocrine tumors. We also tested the hormonal status of all cases for estrogen receptors (ER), progesterone receptors (PR), and ERRB2. From the 33 metastases, 26 (78.79%) cases were calretinin-negative and seven cases expressed the marker. Five (15.15%) cases were triple-negative (ER-, PR-, Herceptest-). Of these five cases, three cases were calretinin+ and two cases were calretinin-. Three out of the seven cases that expressed calretinin were triple-negative. From the seven primary cutaneous apocrine tumors, only one showed focal expression of calretinin, and six of them showed a triple-negative immunophenotype. Only the ER+, PR+ case showed morphologic features on an "in situ" apocrine carcinoma. We concluded that our findings support the value of calretinin in the differential diagnosis between a metastasis from breast carcinoma into the skin and a primary cutaneous apocrine carcinoma (CAC), especially in triple-negative cases. However, hormonal markers plus calretinin would not be sufficient to discriminate between both diagnostic possibilities, and they are probably better used when integrated in a wide immunohistochemical panel. In this study, we analyzed the microvessel density (MVD) for CD105+ and alpha-SMA+ vessels and the VEGF immunoexpression in 38 gastric carcinomas. CD105+ MVD had superior values at the advancing edge compared with the intratumoral area, no matter of the analyzed clinico-pathological parameters, the difference being significant only in intestinal type, moderate differentiated carcinomas as well as in T2-T3 carcinomas, without lymph node metastases (p<0.05). Intratumoral expression of CD105+ MVD indicated significant differences related to histological type (p=0.006), depth of invasion (p=0.027) and lymph node metastases (p=0.009), but without statistical association in case of the advancing edge or metastases. The assesses of alpha-SMA+ MVD indicated no differences between intratumoral and advancing edge areas, no matter of the analyzed parameters, excepting intestinal type carcinomas, which presented significant high values (p=0.003) at the advancing edge. VEGF score revealed significant differences related to histological type (p=0.020), differentiation degree of the intestinal type carcinomas (p=0.036) and depth of invasion (p=0.049). In case of metastases, the levels of VEGF expression were higher in the primary tumor, without statistically significant differences (p>0.05). It were significant differences of intratumoral VEGF expression depending on CD105+ MVD values (p=0.019), but not with alpha-SMA+ MVD (p>0.05). Angiogenesis evaluated through the VEGF and MVD (CD105+ and alpha-SMA+) expression is correlated with the progression and metastasis of gastric cancer and could be considered a prognostic marker of these tumors. Background: Helicobacter pylori infection is an important cause of gastritis in childhood, its role in the pathogenesis of peptic ulcer disease in adults and children being generally known. In some cases, there are therapeutic management issues, because they do not heal or they often relapse, although treatment regimens are applied as recommended. Our aim was to analyze the relationship between endoscopic appearance and histological changes of the gastric mucosa in children with gastritis associated with H. pylori infection, in which persistent infection after treatment was found. Materials and Methods: It was a prospective study on 1332 children assessed in our Service (Ist Pediatric Clinic, Tirgu Mures, Romania), between January 2008 and January 2013, for gastritis with various etiologies. There were 609 cases of gastritis-associated with H. pylori infection. Results: The average age of patients was 13.21 years; the higher incidence was noted in 13-18-year-old group, female gender and rural areas provenience; a number of 544 patients diagnosed with gastritis with H. pylori were reassessed subsequently; after treatment, gastritis has healed and the infection was eradicated in 88.23% cases after a month, while in 64 patients infection persisted. After a second regimen, endoscopic-histological modifications persisted in 31 (5.69%) cases; 1.28% cases remained positive for longer. Conclusions: H. pylori infection was associated with high age group, as well as with endoscopic modifications; also, the presence of H. pylori was correlated with histopathologic diagnostic. We try to emphasize the importance of assessing bacterial resistance to antibiotics, studying of bacterial genome and genetic susceptibility of human subjects. Background: The G2 neuroendocrine tumors (NET) or well-differentiated neuroendocrine carcinomas (2010 WHO Classification of Tumours of the Digestive System) embrace different types of evolution despite the fact that they actually are included in the same group of prognosis based on mitotic count and the Ki-67 proliferation index. Aim: We studied the pathological and clinical aspects in patients with G2 NET. 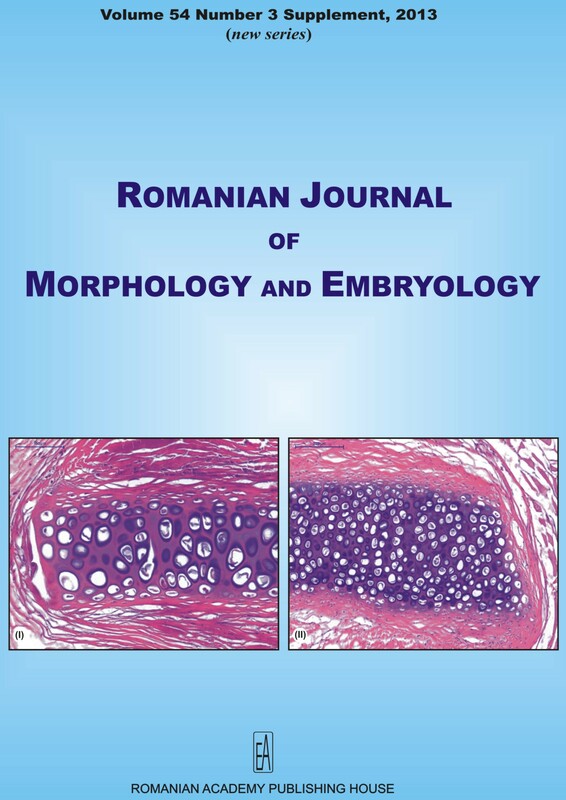 Materials and Methods: This is a retrospective pilot observational study in patients admitted between January 2008 and January 2013 in "Constantin I. Parhon" National Institute of Endocrinology, Bucharest, Romania. They were evaluated based on the pathological report, imagistic scan, and neuroendocrine markers. Results: Nine patients (female/male ratio: 5/4) with G2 NET were included (mean age at diagnosis 54.11 years). Surgery was performed in 66.66% of cases. 44.44% of tumors had unknown origin. 22.22% of patients had negative immunostain for chromogranin A. Synaptophysin was positive in all cases. Neuronal specific enolase (NSE) was performed in 44.44% of cases and it was positive in all these situations. 88.88% of patients had high neuroendocrine markers. Multiple tumors were found in two cases (follicular thyroid adenoma, and a carcinoma of the port vein, respective bilaterally pheochromocytomas). The youngest patient (39-year-old) had atypical onset with bilateral adrenal tumors (positive for CHROMO, EMA, CK-19, CK-20, negative for SOMATO, CK-7, S-100, glucagon, CD57, and a Ki-67 of 15%). Death was registered in two cases, both with bone metastases. Discussion: Some poor prognosis factors may be taken into account as lack of CHROMO immunostain, young age at diagnosis, genetic background, and lack of therapy options as surgery. Larger databases will provide more information. Conclusions: It is possible that the G2 NET group of tumors actually includes some different subtypes or in fact, a late diagnosis of the tumor might be associated with a poor diagnosis. Protein kinase signal-transduction pathways play critical roles in regulating nociception. The c-kit receptor contributes to pain regulation in the spinal cord and is present on both peripheral and central terminals. Expression of c-kit was demonstrated in human trigeminal and spinal ganglia. However, the brainstem expression of c-kit was overlooked. We aimed to evaluate it by immunohistochemistry, on eight samples of human lower medulla oblongata. We used two clones of CD117/c-kit antibodies, from different manufacturers, and neurofilament antibodies. Positive expression of CD117/c-kit was found within the spinal trigeminal nucleus, the gracilis, cuneate, and lateral cuneate nuclei, and within the olivary complex. CD117/c-kit positive interstitial networks of these nuclei were positively labeled with neurofilaments. CD117/c-kit labeled the olivary neurons, but not the magnocellular neurons of the trigeminal, gracilis and cuneate nuclei. c-kit interstitial systems of brainstem could play so an important role for the functional status along the somatosensory neural circuits. Objective: The aim of this research was to assess the immunofluorescence expression (IFE) of cell cycle regulators p16ink4a, p21, p27, in association with proliferation and prognosis factors Ki-67, p53 respectively, in cell cultures, obtained from different types of cervical intra-epithelial lesions. The final purpose was to distinguish a best marker able to identify with high accuracy the high-grade squamous intra-epithelial lesion. Materials and Methods: The study was carried out on 68 epithelial cell cultures. Three senior specialists have analyzed 500 cells/case individually. The statistic analysis for correlation between used markers has been performed. Results: The study batch revealed a very low expression of investigated parameters (<1%) in negative cases for malignancy and intraepithelial lesion (NMIL), a progressive exponential expression in low-grade squamous intraepithelial lesion (LSIL), and a very high expression in high-grade squamous intra-epithelial lesion (HSIL) and invasive squamous cervical carcinoma (ISCC). Ki-67 and p53 were overexpressed in nuclei both in LSIL and HSIL. A slightly direct correlation between p21 and Ki-67 (r=0.35, p<0.001) was observed in HSIL. Statistically significant correlations were noticed between some markers: p16ink4a and p27 (r=0.4, p=0.03), p16ink4a and Ki-67 (r=-0.4, p=0.002). Conclusions: The most reliable parameters for assessing HSIL and ISCC proved to be Ki-67 and p16ink4a. Both were with percentages and intensity of IFE around 100% and higher immunoexpression within the nucleus of cell cultures. Our study reveals that p27 cyclin inhibitor was not reliable in differentiating between LSIL and HSIL. Experimental models for the investigation of nerve regeneration are critical in studying new strategies able to promote the repair process. The aim of the present work was to characterize morphological and functional aspects of sciatic nerve regeneration after mechanical crush injury in rodents. Morphological changes were assessed after a four minutes sciatic nerve injury induced by means of a standardized compression clip. Rat nerve samples were collected before injury and after 24 hours, four days, two weeks, and four weeks after injury, respectively. In an additional group with unilateral sciatic nerve injury, animals were evaluated for four weeks using walking track analysis and the sciatic static index (SSI) measured in both rearing and normal standing position. Histological study showed important axonal degeneration at four days and axonal regeneration at four weeks after injury. We observed no significant differences between SSI in rearing and normal standing stance and a strong correlation between SSI values measured in the two positions during the evaluation period. Positive correlations were also found for the footprint parameters. Our data provide a baseline characterization of the sciatic nerve crush injury that will further allow the investigation of peripheral nerve regeneration in the presence of potential neuroprotective agents in post-traumatic nerve repair. Cutaneous carcinomas are malignant lesions, which most commonly occur on photo-aggressed site. The purpose of our study was to evaluate the immunohistochemical expression of three apoptotic markers (p53, Bax, and Bcl-2) in photoinduced basal and squamous cell carcinoma. The study was performed on 24 patients diagnosed with these forms of cutaneous carcinoma localized on photoexposed regions: 14 cases of basal cell carcinoma (BCC) and 10 cases of squamous cell carcinoma (SCC), classified accordingly WHO 2003. The immunohistochemical study performed on the three proteins involved in the apoptotic process revealed certain specific features in their manner of expression, which do not correlate or respect the critical determinant rule (Bcl-2/Bax>1). Basal cell carcinoma expresses higher levels of Bcl-2, with a better prognosis, a less aggressive evolution, and no metastasis. Squamous cell carcinoma, on the other hand, expresses lower levels of Bcl-2, but the clinical outcome is more aggressive, the tumor has a faster evolution and may metastasize. P53 protein respects the profile given in literature data, having a higher score in squamous cell carcinoma versus basal cell carcinoma. According to the tumor localization on photo-aggressed sites, we have considered that ultraviolet rays play an important role in initiation of carcinogenesis through still occult mechanisms that may induce these particular or rather "bizarre" expressions of apoptotic markers. Introduction: Male breast carcinoma is a rare condition, but with a trend of increase frequency. In our study, we investigate the clinico-pathological features and overall survival at 35 male cases of primary invasive breast carcinoma correlated with molecular subtypes defined by immunohistochemical profile. Methods: Based on immunohistochemical expression profiles of estrogen receptor (ER), progesterone receptor (PR), human epidermal growth factor 2 (HER2) and Ki67, EGFR and CK5/6, the male breast cancers were classified into the following molecular subtypes: Luminal A, Luminal B, HER2+, triple negative and unclassified. Results: In our study, we identified 65.7% as Luminal A subtype and 28.6% as Luminal B subtype. The difference was represented by two (5.7%) cases of triple negative subtype, but due to low number of patients, no correlations or prognostic significance could be assessed in these cases. No HER2 or unclassified subtypes were identified. Conclusions: Luminal A tumors are the most frequent subtype in MBC, with a better outcome than Luminal B subtype. We recorded high levels of ER and PR expression, which predict a better response to adjuvant hormonal therapy. At the time of diagnosis, most of the patients were aged and with an advance clinical stage, this requiring implementation of screening programs and increase education of population in order to an early detection. The face, seen as a unitary region is subject to the gravitational force. Since it is the main relational and socialization region of each individual, it presents unique ways of suspension. The elevation system of the face is complex, and it includes four different elements: the continuity with the epicranial fascia, the adhesion of superficial structures to the peri- and inter-orbital mimic muscles, ligaments adhesions and fixing ligaments of the superficial layers to the zygomatic process, and also to the facial fat pad. Each of these four elements were evaluated on 12 cephalic extremities, dissected in detail, layer by layer, and the images were captured with an informatics system connected to an operating microscope. The purchased mesoscopic images revealed the presence of a superficial musculo-aponeurotic system (SMAS) through which the anti-gravity suspension of the superficial facial structures become possible. This system acts against face aging and all four elevation structures form what the so-called sustentaculum facies. The participation of each of the four anatomic components and their approach in the facial rejuvenation surgeries are here in discussion. Background: The nose is a complex and defining organ not only for its respiratory, olfactory and phonatory function but also for facial esthetics. It is plastic and reconstructive techniques are at the same time an otorhinolaryngological issue and an interdisciplinary one. Materials and Methods: Among the materials used for reconstructive-reparatory surgery of the nose, we can distinguish the elastic ear cartilage transplant from patients own auricle. By analogy, we used in our experiment the rabbit ear as donor site and three radically different types of tissue as integrating structures. The modifications of the cartilages transplanted into abdominal subcutaneous tissue, muscles of the hip and under the skull periosteum were monitored through monthly sacrificing of the experimental animals. Results: No matter of the presence or lack of own perichondrium coverage the cartilage pieces showed radical transformation to total changes in structure from perichondral fibrosis to endochondral ossification and even complete resorption. Conclusions: We consider that at least a part of the reconstructive and esthetic plastic surgery failure comes from not knowing these significant changes that take place on the insertion site of own transplanted cartilage. The future surgical guidelines should remember the phenomena described for the first time in our research. To evaluate the correlations between patient, tumor and therapeutic features and DCIS recurrence after primary treatment, a cohort of 132 cases of DCISs, treated at "Prof. Dr. Ion Chiricuta" Oncology Institute, Cluj-Napoca, Romania, between 1999 and 2010, were studied. Present study showed that age <45 years at diagnosis and presence of the necrosis were significantly correlated with recurrence, meanwhile nuclear grade is significantly correlated with quicker relapse meaning that for high-grade lesions recurrence occurs usually during the first 36 months of follow-up, meanwhile for non-high-grade lesions recurrence usually occurs after 36 months of follow-up. Also, the study showed that a important factor correlated with recurrence (both local and overall) for patients treated with breast conservative surgery (BCS) was the status of the resection margins as well as the association of adjuvant radiotherapy. Overall recurrence rate was 9. (84)% and during a mean follow-up of 62.99 months with limits between 24 (imposed by study) and 153 months, standard deviation 29.28. The significant rate of failure of endodontic treatment to lower incisors was attributed to poor knowledge of their endodontic morphology. As emphasized by Tinelli ME et al. (2011), the morphology of the endodontic system is strongly related to ethnicity, making possible the existence of important anatomical variations at different population groups. The present study analyzes, using radiological means, the endodontic anatomy of lower incisors extracted from a Romanian population. Five hundred seventy-five lower central and lateral incisors were radiographed and Weine's classification was used to evaluate their endodontic morphology. After processing the data, it was concluded that 81% of the studied teeth have one canal and the remaining 19% have two canals. In terms of endodontic configuration, 81% of 575 studied teeth are Weine Type I, 17% Type II, 1% Type III and 1% Type IV. Results obtained in this study are within existing international endodontic literature. Type II and IV configurations have a high degree of treatment difficulty. This requires thorough clinical and radiological examination of several incidents, possibly cone beam computed tomography (CBCT) and individualized therapeutic means to ensure treatment success. This study is the first of this magnitude in the Romanian specialty literature. Objective: In this study, we mapped the topography of the greater palatine foramen (GPF), within the South-Eastern European population, according to clinically identifiable anatomical landmarks. Materials and Methods: We used 100 dry adult human skulls, of which 75 were bilaterally dentate, whereas 25 were partially edentulous. Results: The shape of the GPF was oval in 84% of the cases. The foramen was located internally from the third molar in 73% of the skulls. The greater palatine canal showed an antero-infero-medial direction in 82% of the cases. The average values of the distances between the GPF and the oral surfaces of the maxillary third molar, the medio-palatine suture, the posterior margin of the hard palate, the pterygoid hamulus and the pterygo-maxillary suture were 11.0 (SD 1.5), 14.5 (SD 0.8), 4.4 (SD 1.1), 12.0 (SD 1.8) and 10.5 mm (SD 1.3), respectively. Conclusions: A thorough knowledge of GPF's various positions may assist the clinicians in providing improved surgical techniques in the area. Nonalcoholic fatty liver disease (NAFLD) ranges from simple hepatic steatosis to steatohepatitis (NASH) and cirrhosis. The aim of this study is to test beneficial effects of omega-3 fatty acids (DHA 130 mg, EPA 25 mg) treatment in NAFLD, in a mouse model of non-alcoholic fatty liver disease. As pretreatment, 50 mice were fed for one month with a high-fat diet to induce NAFLD. Then, the mice were divided in different groups according to diet (normo- or hypercaloric), with and without treatment with omega-3 fatty acids, for another month, forming the post-treatment group. The liver and blood samples were collected for biochemical and histopathological analysis. Biochemical parameters including: glycemia, total cholesterol, triglycerides, uric acid, albumin, total plasma antioxidant capacity (TEAC) was measured in serum. Glutathione (GSH), total thiols and malonyldialdehyde (MDA) were determined in mouse liver homogenates. Mice from post-treatment group, on hypercaloric diet with or without omega-3 fatty acids treatment, had medium hepatopathy (granular and vacuolar degeneration of the hepatocytes) and hypertriglyceridemia. Omega-3 fatty acid treatment lowered the rise of triglycerides (p<0.03), glycemia (p<0.01) and cholesterol (p<0.02) in serum and MDA level of the liver (p<0.05). Mice from post-treatment group, on normocaloric diet with or without omega-3 fatty acid had different histopathological and biochemical results. Those with normocaloric/normolipidic diet and omega-3 fatty acids treatment had reversed liver histopatological results from NASH to normal aspect and had the best metabolic parameters results. In conclusion, omega-3 fatty acids treatment associated with a normocaloric/normolipidic diet has hepatoprotective action in nonalcoholic fatty liver disease. The objectives of this study were to test the biocompatibility and to evaluate the osseointegration of Titanium-Aluminum-Niobium (Ti6Al7Nb) alloy used in the manufacturing of personalized implants with selective laser melting (SLM) technology and to compare the growth viability of osteoblastic-like cells on different Ti6Al7Nb alloy samples (plain, coated with hydroxyapatite or SiO2-TiO2) implanted into the cranial bone of Wistar rats. In terms of biocompatibility, the cone-beam computer-tomography head scans taken at the moment of sacrifice of each group (one, two and three months) showed no implant displacement, no osteolysis and no liquid collection around the implants. At one month, around all types of implants new bone formation was noticed, although around the plain Ti6Al7Nb implant a large amount of powder debris was present. Still, no inflammatory reaction was seen. At two months, the distance between the implants and the calvarial bone margins diminished. A thin layer of fibrous tissue was noticed around the Ti6Al7Nb implant coated with hydroxyapatite but no bone contact was achieved. In the group sacrificed at three months there was still no bone contact, but noticeable were the SiO2-TiO2. In the group sacrificed at three months SiO2-TiO2 particles detached from the implant and completely integrated in the tissue were noticeable. All results suggested that the Ti6Al7Nb alloy with or without infiltration is well biologically tolerated. Structural and functional alterations, as well as changes occurring in the aspect of the skin during the ageing process, are due to some complex mechanisms, determined by intrinsic and extrinsic factors, which act synergistically. This study aims to analyze the histological changes of collagen and elastic fibers and of skin vasculature that occur in time, during the process of ageing. Fragments of skin have been collected from subjects of both sexes and of different ages, totaling 121 samples from different body regions. The following stains were used: Modified Goldner's Masson trichrome, Ferric Orcein-Hematoxylin and the combined stains Orcein-Goldner's trichrome. As the process of ageing advances, collagen fibers become thinner and change their aspect; at advanced age, the lysis of collagen fibers and their thickening in the deep dermis is present, as they become more fibrous. Elastic fibers show the tendency of fragmentation at more advanced age, gradually change their tinctorial affinity and reduce in amount; in the deep dermis, they tend to thicken progressively, in the presence of discrete elastolysis processes that evolve steadily and irreversibly. Thus, processes of elastic fibers degeneration and lysis run faster by comparison with those of collagen fibers degeneration. With ageing, a progressive reduction of dermis vasculature is present, due to a reduction in the number and size of vascular vessels, which is in its turn associated with the progressive alterations of vascular walls components, changes that advance until the function of the vessel ceases. Eosinophils of the gastrointestinal tract are involved in the host immune response that occurs in the presence of the pathogens in the digestive lumen, taking part in maintaining the homeostasis of the gastrointestinal epithelium. Their involvement in inflammatory processes of chronic gastritis is less known. In our study, we identified the presence of eosinophils in chorion gastric mucosa (lamina propria) in over 34% of chronic gastritis. Eosinophils were more numerous in atrophic gastritis with intestinal metaplasia. More than 65% of chronic gastritis associated with Helicobacter pylori also had eosinophils in the gastric mucosa. Oral mucosa becomes thinner, smooth and looses stippling aspect with aging. From histological standpoint appears: narrowing and alteration of gingival epithelium, modification of epithelial-connective interface and decreasing of keratinization. However, it cannot be detected significant histological alterations in size, shape or arrangement of epithelial cells that could be endorsed to aging process. Histological studies indicate: decreasing of keratinization, regressive changes in epithelium and fibrosis in underlying connective tissue. Parakeratosis is frequent with aging because of microtraumas, in many cases is expression of permanent inflammation. Purpose: The aim of this paper is to assess the histopathological changes and the condition of oxidative stress in the saliva of the patients with periodontal disease. Materials and Methods: We have carried out our research on two groups of patients with periodontitis (a group of 16 patients with stage I periodontitis and a group of 16 patients with stage II periodontitis), who we have compared, using samples of saliva and serum, to a group of 15 volunteers without any dental restorations. To dose MDA, we used thiobarbituric acid method and for determination of ceruloplasmin the Ravin's method. For histopathological examination, the periodontal fragments were immediately underwent for fixation in 10% neutral formalin solution and then, they were included in paraffin using the conventional histological technique. Results: The group of patients with stage II periodontitis presented lower values of salivary MDA compared to the group of patients with stage I periodontitis. Patients with stage I periodontitis presented a significantly increased concentration of MDA in the serum compared to the control group, but considerably lower concentrations compared to patients with stage II periodontitis. The values of serum ceruloplasmin do not present statistically important changes in patients with stage I periodontitis compared to those suffering from stage II periodontitis and to those from the group control. Conclusions: MDA is not a product of blood filtration as the concentration of MDA in the bloodstream is bigger than in the saliva. Tissue changes and biochemical aspects are strongly connected. Removing dental plaque can prevent oral infections. The aim of this histological study was to analyze the gingival reaction to fixed orthodontic appliances. Gingival specimens were obtained with minimal trauma from 11 patients treated with fixed appliances in different intervals during the orthodontic treatment, including post-treatment periods. Serial sections were stained with Hematoxylin-Eosin. T- and B-cells were identified by specific antibodies, using a double staining technique with Avidin-Biotin method. Histological observations demonstrated and confirmed the presence of gingivitis during orthodontic treatment. According to the usual histological evaluation, the biopsies revealed the presence of hyperplastic chronic inflammatory changes from mild to moderate severity. The lack of rapid increase of CD20+ cells demonstrated that the gingival inflammation did not cause overall tissue destruction. Objectives: Biologic therapy such as Etanercept, which is a tumor necrosis factor alpha (TNF-alpha) inhibitor, has been extensively used as election therapy in rheumatoid arthritis. The purpose of this case presentation was to inform about the possibility that lichen planus lesions could potentially become complicated by secondary infections in patients treated with Etanercept. Furthermore, we aimed at analyzing if the complication of the cutaneous lesion was coincidental or it was due to the immunosuppressive systemic therapy, and whether the infected lesion would respond to antibiotic therapy. Case summary: The patient was a 59-year-old woman with rheumatoid arthritis and that have had lichen planus lesions for approximately 25 years. Only recently, she had been received immunosuppressive therapy (Etanercept and Methotrexate). Further on, the lichen planus flared up with a secondary infection determined by a Methicillin-sensitive Staphylococcus aureus. Uncommon myocardial complications were also characteristic of this case. Results: While a case report described already the appearance of lichen planus following Etanercept therapy (Battistella M et al., 2008), the possibility that the lesion could become secondary complicated following this therapy was never reported before, according to our knowledge. Additionally, we describe in this case the interplay between Etanercept therapy and hypertrophic cardiomyopathy. Conclusions: Our case is not a lichen planus induced by Etanercept, but it is aggravated and secondary infected with Methicillin-sensitive Staphylococcus during the therapy. The additional cardiac complication (hypertrophic cardiomyopathy) may represent solely an evolutive sign of rheumatoid arthritis and therefore not influenced by Etanercept. Myocardial bridging (MB) is defined as the presence of an intramural course of a coronary artery, most likely caused by a defect in resorption of the musculature that encircles the epicardial arteries during morphogenesis. We present a case of the young man who died suddenly while playing professional football and whose cause of death was acute myocardial infarction associated with multiple myocardial bridges (1.8 cm on the anterior interventricular artery, 1.3 cm on the circumflex artery, and an intramyocardial trajectory of the posterior interventricular artery), and discuss the causes of death and possible consequences of this pathology. Nasopharyngeal carcinoma is the predominant tumor type arising in the nasopharynx with cervical lymph nodes present in 60-90% of all cases at the time of presentation. The most frequent pathological varieties include squamous cell carcinoma well-differentiated keratinizing, moderately differentiated non-keratinizing and an undifferentiated type. We present a case of non-keratinizing undifferentiated carcinoma of the nasopharynx with parapharyngeal and middle cranial fossa space involvement in an 18-year-old male who has been admitted in our hospital for recurrent right ear otitis media. Symptoms consisted in mild conductive hearing loss, trigeminal V2 nerve anesthesia, right ear tinnitus, mild dysphagia, mild dysphonia, right hypoglossal nerve paralysis and right Claude Bernard-Horner's syndrome. Clinical examination revealed no lymph node masses, chest X-ray corresponding to a normal thoracic image. Cranial contrast enhanced CT scan showed a non-homogenous mass of 5.4/4.5/5.5 cm from the level of the right rhinopharyngeal wall, extending in the right parapharyngeal space, invading the right middle cranial fossa. Cranial MRI with contrast enhancement revealed a rhino- and parapharyngeal mass of 5.5/4.6/5.3 cm with intracerebral extension in the right cavernous sinus, right internal carotid artery being engulfed by the tumor mass with partial compression. Several lymph node masses of 1.7/1.2 cm were also revealed. We performed rhinopharyngeal biopsy, right tympanotomy and grommet tube insertion. The tissue specimens were processed with routine histological technique. Subsequent immunohistochemical reactions for pan-cytokeratin AE1/AE3 and leukocytes common antigen were performed. The histological examination of routine stained slides showed that malignant tumor cells had a syncytial pattern of growth in a background of small lymphocytes. The positivity of tumor cells for pan-cytokeratin established the final diagnosis of non-keratinizing undifferentiated carcinoma. The age of onset, the clinical signs and symptoms and minimum involvement of lymph nodes represents the particular aspects of the case. Variations on the neuromuscular structures of the upper limb reflect the complex development of that region. Many of them may be important during surgical and/or diagnostic procedures; however, some of them are of academic interest. Here we report a case of six neuromuscular variations in a single upper limb. During routine educational dissection for the undergraduate medical students at the Department of Anatomy, Faculty of Medicine, Hacettepe University, Ankara, Turkey, we came across six variations on the left upper limb of a 43-year-old well-built male cadaver. We conformed to the steps described in Grant's Dissector during the dissection, and photographed the case with a Nikon Coolpix camera. The biceps brachii showed an accessory head that originated from the tendon of pectoralis major, ran downwards superficial to the long head and joined the distal 1/3 of the muscle mass. A thin muscle band accompanying the lateral side of the pectoralis major was identified as pectoralis quartus. It was originated from the sixth rib and inserted to the coracoid process. The coracobrachialis was double-headed having a common origin from the coracoid process, separating into two after a short course and joining again at the middle level of the arm. Musculocutaneous nerve did not pierce the coracobrachialis. Instead, it ran beneath the two bellies of the muscle. The lateral cord of the brachial plexus passed between the two bellies of coracobrachialis; then divided into musculocutaneous nerve and the lateral root of the median nerve at a lower level than usual. The right upper limb showed no variations. The variations described here maybe commonly encountered individually; however, the combination of six of them in a single arm is previously unreported. Basal cell carcinoma (BCC) is the most common cutaneous cancer. It seems that the most important prognostic factor is exposure to ultraviolet radiation (solar and artificial), correlated with other factors as well. In this article, we aimed to review basal cell carcinoma located in the axilla, referring to cases from our hospital. Axillary location of BCC is rare, with a very low number of cases quoted in the literature, compared to the high prevalence of basal cell carcinoma in the general population. During a period of two years, we detected only four cases of axillary basal cell carcinoma out of a total number of 921 cases diagnosed as BCC. We were interested in identifying certain factors involved in causing BCC, post-excision clinical evolution, histological type and aggressiveness of axillary basal cell carcinoma. Therefore, we quantified objectively the tumor and stromal expression of some immunological markers like: metalloproteinases MMP1, 3, 11, Ber-EP4 and Ki67. Histological types of tumors investigated here belong to the category of non-aggressive BCC, namely as nodular and superficial, although Ki67 index is greater than the average reported in the literature for this type of tumor. MMPs exhibited increased expression in tumors and stromal compartments, especially at the tumor invasion front, and was not associated with tumor ulceration or surrounding tissue remodeling-related changes. Our results confirm the literature data concerning the involvement of MMPs in BCC progression, whatever the tumor location is. Angle Class III malocclusions are not so frequently met but they raise big problems of treatment. The analyzed case represents a 14-year-old patient that came to the dental consulting room with an Angle Class III malocclusion determined by the excess of the somatotropic pituitary hormone and a gingival hyperplasia more emphasized at the level of inferior frontal teeth. The patient followed a fixed appliance treatment, the straight-wire technique. All along the treatment and after it, the hyperplasia and the gingival inflammation not only maintained but they even got worse. Thus, an improper hygiene associated with a severe Angle Class III malocclusion maintains and aggravates the gingivitis. The histological and immunohistochemical study of the gingiva revealed important epithelial modifications that led to an epithelial hypertrophy with a tendency toward acanthosis and to severe epithelial erosions. An inflammatory chronic process (rich in lymphocytes, plasma cells and macrophages full of angiogenesis vessels) and an intense reaction of the fibroblastic cells appeared in the gingival corium. We report a case of a 42-year-old woman with systemic lupus erythematosus and chronic kidney disease stage 5 undergoing continuous ambulatory peritoneal dialysis, presenting asthenia, dizziness, abdominal pain and small efforts dyspnea. After a complete physical and clinical examination, including laboratory tests, esophagogastroduodenal endoscopy and gastric lesions biopsy, she was diagnosed with gastric antral vascular ectasia. We are facing a rare case of antral vascular ectasia in a patient associating both chronic kidney disease and autoimmune disease. Juvenile nasopharyngeal angiofibromas (JNA) are rare, benign, highly vascular tumors which appear in proximity to the sphenopalatine foramen. The tumor arises most commonly in adolescent males suggesting that in could be hormonally responsive. Although it is histologically benign, it has a high destructive potential and a high grade of recurrence. It is a fibrous vascular tumor with vascular sources from branches of the external or internal carotid arteries. Modern treatment of JNA includes surgery and also radiotherapy, chemotherapy and hormone therapy. This paper presents two cases from the eight of our clinic's experience, with morphological features which made their treatment challenging. Objective: A presentation of the clinical and pathogenic aspects of choroidal ossification. Cases Presentation: We report three clinical cases of choroidal ossification: choroidal osteoma, ossified choroidal hemangioma and total ossification of the choroid. The three patients underwent complete eye examination. The optical microscopy of a sample of ossified choroidal tissue revealed a spongy, osseous structure consisting of circular osseous lamellae, osteocytes, canaliculi and adipose tissue with microfoci of calcification. Discussion: Choroidal ossification is characterized by reduced frequency of occurrence, accessible clinical diagnosis, and unspecified pathogenesis. Several of the factors identified in the pathogenesis of intraocular ossification may play a role in the ossification of the choroid: chronic inflammatory cells, bone morphogenetic proteins, growth factors and mesenchymal stem cells. In addition to these factors, pericytes have a special role in the pathogenesis of choroidal ossification. Under the influence of bone morphogenetic proteins and growth factors, mesenchymal stem cells differentiate into osteoblasts. They secrete bone matrix (osteoid), whose regeneration and remodeling lead to the formation of bone tissue. The spongy bone structure of choroidal tissue points to a model of endoconjunctive/desmal ossification. Conclusions: The knowledge of the clinical aspect of ossification of the choroids is required for the differential diagnosis with the posterior pole affections, and also for the prevention and treatment of secondary complications. Dens invaginatus (DI) is a dental anomaly originated from invagination of the enamel organ into the dental papilla, during odontogenesis. DI may be associated with other abnormalities such as dysmorphic mesiodens, and this unusual condition may be detected by chance on the conventional radiography. However, the three-dimensional nature and the exact morphological patterns of DI are impossible to appreciate from this method. We present a morphological study of impacted mesiodens in a 9-year-old girl, which the three coronal invaginations were detected only by Cone-Beam Computed Tomography (CBCT) in the pre-surgical examination. CBCT, radiographic and microscopic reproductions allow transfer of images to facilitate cooperation of working groups, examination as well as for teaching purposes. Littoral cell angioma is a rare tumor of the spleen, usually being considered benign and typically discovered incidentally. There are three different modalities of presentation: tumoral splenomegaly, long-standing iron deficient anemia or thrombocytopenia due to hypersplenism. However, some of its manifestations could generate the suspicion of a lymphoma or other more serious condition. We present the case of a 46-year-old man with splenomegaly and iron deficiency anemia. The tumor affected the whole spleen, which was surgically removed. The histopathological examination, together with immunophenotyping, established the diagnosis. Six months after the procedure, the patient is in very good condition. Several differential diagnoses were discussed, as well as the prognostic factors. The case illustrates a rare cause of anemia and the importance of pathology in uncovering such unusual causes for this. Giant maxillary cysts deserve one's attention, mainly because of all the complication they can originate, such as facial aesthetic changes, jaw fractures, infections and occasional but the most severe one the neoplasia of its epithelium. Here we present the case of a 51-year-old man who was sent to the Clinic of Oral and Maxillofacial Surgery of Timisoara, Romania, because of a facial asymmetry due to the hyper-dimension of the right superior genian and labial region, consecutive to the volume growth of the subjacent alveolar process. The clinical and paraclinical investigations, especially the fine-needle aspiration and the 3D imagistic investigation, most likely lead to the diagnosis of maxillary cyst with intrasinusal evolution, the lesion being caused by the untreated teeth of the superior right hemiarcade. The surgery was performed in general anesthesia and consisted of a cystectomy and the curettage of the right maxillary sinus, followed by the restoration of alveolar process with the help of bone graft materials. The histopathological examination of the lesion confirmed the diagnosis of maxillary radicular cyst. This case shows the frequently asimptomatic and long-term evolution of maxillary cysts, their growing volume causing massive bone destructions and affections of the neighboring anatomic structures. An aberrant muscular fascicle, the so-called "accessory cleido-occipital muscle", originated from the anterior border of the cleido-occipital portion of the right trapezius muscle, was detected during a routine dissection of a female cadaver. The aforementioned muscular bundle coursing in the posterior cervical triangle, almost parallel to the anterior border of the trapezius muscle, inserted ultimately to the clavicle's medial third. In addition, prior to its insertion, the muscle provided a fibrous arch attached to the midportion of clavicle, overlying the main trunk of supraclavicular nerves. We noted that during abduction of the right arm, the fibrous arch entrapped the supraclavicular nerve trunk, presumably leading to sensory disturbances in nerve's area distribution. We review the relative restricted data in the available literature concerning that muscular variant and elucidate its importance during differential diagnosis of a mass and surgical exploration of the posterior cervical triangle. Colorectal cancer usually presents with alterations in the bowel habit. Less commonly, the presenting symptoms may be part of a paraneoplastic syndrome. Metastasis can occur by lymphatic or hematogenous spread, most frequently to the lungs and liver. We present the case of a 56-year-old man admitted with paraneoplastic polymyositis due to a poorly differentiated colon adenocarcinoma. The evolution was unfavorable with death on the 19th day following admission due to pulmonary thromboembolism and subsequent pulmonary edema. Autopsy showed micrometastases with lymphatic and venous emboli to the heart, liver, kidney, adrenal gland and lung. The case highlights the diversity of manifestation that can occur in a colon adenocarcinoma. Malignant tumors represent one of the most important medical problems, due to the increased mortality rate, life quality alteration, and the lack of a curable treatment. Skin neoplasm ranks first most frequent top primary tumor, summing a higher percentage than any other neoplastic location. It is also known, the fact that, in our country, gastric adenocarcinoma represents the most encountered tumor of the digestive tube. Our case, male, 49-year-old, comes from a rural area, was diagnosed with and surgically treated, within one year, for gastric adenocarcinoma (intestinal type gastric carcinoma) and squamous cell carcinoma (at the level of the lower lip). A high number of etiologic agents are associated with different risks in developing a carcinoma with squamous cells at the level of the head and the neck, and a gastric carcinoma (our patient is known to suffer from gastric ulcer and Helicobacter pylori, for more than 20 years, and he is a chronic consumer of alcohol and nicotine). 38. Comment to the Letter to the Editor: Does "signet-ring stromal tumor" exist? In reply to the comments by Teresa Pusiol et al.